The Mayor’s Health & Fitness Council (MHFC) is recognizing Austin’s top health and wellness programs for businesses and organizations of all types and sizes via the Mayor’s Health & Fitness Awards. These awards highlight local workplaces and schools that have implemented healthy changes to create environments that support health and well-being. ​​Top ranking businesses and organizations will be eligible to win a $1,000 grant to support ongoing health and wellness initiatives! 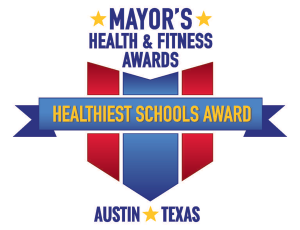 ​​​​​Winners will be announced at the 2019 Mayor’s Health and Fitness Awards Ceremony tentatively scheduled for Friday, September 13, 2019 at Austin City Hall. Not sure which application to choose? Find information about MHFC Partner Certification on our website or contact us at info@mhfcaustin.org or (512) 972-6472. Every year the Mayor’s Healthiest School Awards highlight schools that have implemented healthy changes to create school environments that support the health and well-being of students. The MHFC hosts an annual awards ceremony at City Hall to recognize the efforts of partners who strive to make Austin the fittest, healthiest community in America.